Growing tomatoes at the same height so that they can be easily picked by a harvesting robot. Growing deeper roots where the soil is dry. These types of changes to plant architecture may well be enabled in the future thanks to scientists from Wageningen University & Research who have shown how to stimulate stem cells in a specific spot. "We have proven a simple model for organising stem cells at a precise location in the plant," says Ben Scheres, professor in Development Biology. Professor Scheres has spent many years studying the Arabidopsis plant, which is commonly known as thale cress. His team's goal was to understand how plants program their stem cells in the seeds and reprogram them in the lateral roots: "Stem cells produce new plant tissue and continue to make new leaves, flowers and roots throughout their lifecycle," he explains. "Our research at Wageningen University & Research shows that two very different systems collaborate in the plant root to determine to a very precise level where those stem cells should be." Both systems are extremely flexible: one constantly reacts to the quantity of the plant hormone auxin, which is always in flux, while the other responds to the changing movement of a protein. "The plant programs the stem cells exactly where the two systems come together, such as in the root tips, in recently developed lateral roots and during the regeneration (recovery) of damaged roots," says Scheres. "This knowledge will ultimately help us adapt the architecture of the plant, generating a variety of new applications for agriculture and horticulture." The agricultural sector is constantly looking for ways to develop crops with a higher yield and production. "Good insight into the growth and development of the plant is essential in this respect," Scheres continues. "When you cut off a root tip, you can actually see the stem cells under the microscope. The new research enables us to understand how new stem cells are programmed. 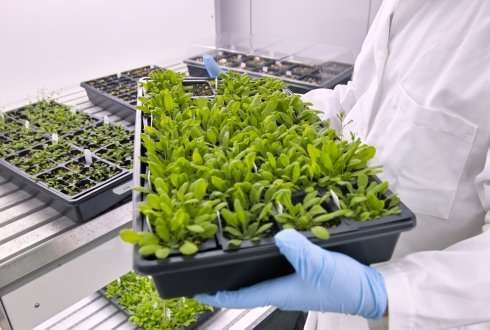 This knowledge can also help accurately steer the regeneration (recovery) of plants from proliferating cells – an important process in horticulture – via the genes." The next step for the research team is to actually adapt the architecture of a crop. "We already have a few ideas about this, although I cannot reveal concrete examples at this point. In the future we may be able to predict from the drawing board: 'this is how to make more and thicker roots' or 'this allows us to align all the leaves'."